Rogue Women Writers: Another New Year, Another Failed Resolution? It’s that whole New Year’s thing. In with the new, out with the old. We strive to do better this year than last. I love reading about everyone's resolutions or projects, and was inspired by Rogue Jamie Freveletti's post to share my own. For me, every single year, I promise to write more, eat less. Or write better, eat better. Definitely not write more, eat more. Years ago, author Laura Lippman turned the whole New Year’s Resolution routine on its ear by coming up with the "One Word Resolution." It’s brilliant. Sort of like creating that high-concept idea for a novel, but in this case, a high-concept theme for the year. (BTW, her word this year is “innovate.” Here's a link to the NYT article about it.) I really like this idea. Novels with themes are thought to be much stronger, so why not a year in my life with a theme? Next on my list, stay organized for the year. If I get my office set up properly (quit laughing! ), I’m hoping it’ll prevent the stacks of random things that get shoved on my desk because they don’t really have a home. I can’t tell you how many new desks I’ve bought over the years, thinking that’ll magically take care of the problem. Since I’ve already experimented with them, let me save you the trouble of thinking that’s the cure-all. A roll top desk only works if you have less stuff than will fit on the surface around your computer. An L-shaped “return” desk only gives you more space to put stuff—or as I call it, "horizontal filing." A regular desk with file drawers is like the L-shape, but fills up much faster. (Pro-tip for horizontal filers: you can pull out the drawers and file right on top of them.) It's not just desks I've bought to transform my space. There's also books. No, not the one's we love to read. I'm talking books on organizing. Take it from me. If you're reading a book on how to declutter, you probably won't get far. Save your money. Adding to the pressure, tax time is right around the corner. 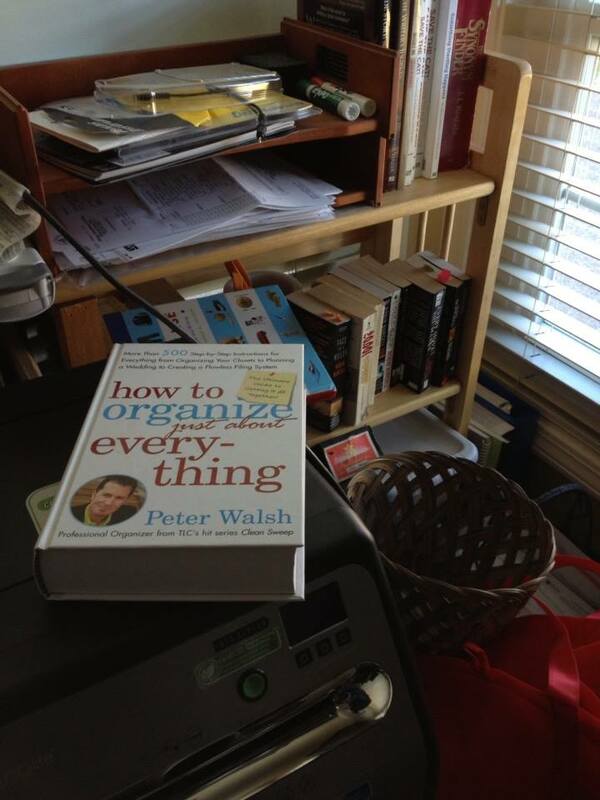 In that respect, I’m slightly more organized. I keep every scrap in a file folder marked with the year. Every January, I enter it all into my spread sheets, scan each document and receipt, store it by year in a plastic file box, and put it in a cupboard. Should the IRS come calling, I'm ready. I’d love to thin out the stuff I’ve collected over the years. 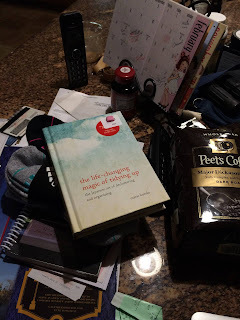 Everything I don’t need or am hanging onto for the kids, or… Well, you get the drift. This year, when it came time to take-out/put-away Christmas decorations, I channeled Marie Kondo. Anything that didn’t "spark joy" went into a donation bin. 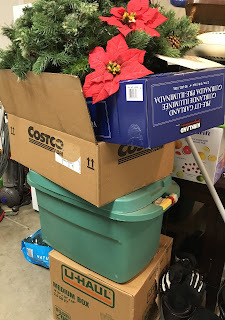 I actually got rid of three large containers of Christmas stuff that will, I hope, find a new home, and help profit the local animal shelter. In case you’re wondering, I’ve started my annual January-eat-healthier-until-October quest. Wish me luck. I’d dearly love to make it until February, maybe even March, before I fall off. My goal is to lose enough weight so that I only weigh as much as I did back when I first thought I weighed too much. (For the record, that’s thirty pounds and thirty years ago.) I see some new running shoes in my future. square one. (And to be really fair, had I not been running, I would’ve been in way worse shape during recovery.) I’m back up to two miles—walking—not quite the same, but better than nothing. So, get-fit/stay-fit is high on my list. Lest we forget the writing... This year, I need to set lofty goals and keep them. I want to know how to better schedule my work day. How do writers juggle multiple projects? (All suggestions welcome. I really, really want to know.) I need to remind myself that this is a business, not a hobby. That when I play on Facebook and Twitter, I am expending way too much creative energy. Why am I checking social media first thing in the morning? I need to remember to pay myself before I pay others. (Entertaining people with posts, emails, tweets is not getting the writing done. Doesn’t do us any good to promote ourselves on social media if we've got nothing to promote.) I do have one tool in my box, recommended by author JT Ellison. The Freedom app. (Typically I don't advertise apps, but this one is worth it.) I can set chunks of time to block out social media. I can easily bypass it, but amazingly, just the fact it’s blocked helps keep me on task. How about you, Rogue Readers? Any suggestions on how to block out writing time? Juggle multiple projects? And, are you ready to take the one word resolution challenge? What’s yours? Lucky for me, my husband is (sort of) at peace with knowing this. I'm afraid my messy desk disease might be incurable! Great list of reminders, Robin! I keep so many files for writing -- my notes and research for the next thriller are now not just stacked up - they are in a box(!) under a table holding my other files. As for your question about one word to describe what we might want to think about in the New Year -- one that comes to mind is "appreciate" -- I want to take time to appreciate my husband, opportunities, friends -- but also the many ideas that they often offer for the next story I should write. Thanks for a great post. Great word, Karna. It's something that encompasses so much into a small package! Can you apply the Freedom app to everything? Block out time for the multiple projects, depending on their order of priority! I don't think so. I think it's only good to block social media or websites of choosing. But you can also schedule block out time in advance, so every day between this hour and that hour, bam, instant block. My goal is to lose enough weight so that I only weigh as much as I did back when I first thought I weighed too much. Ha! Back then I didn't appreciate my mild weight gain. Now, I really appreciate it. Unfortunately, no time travel machine! You are going to start running! Yes! Every July at Thrillerfest a group of us go for a fun run in Central Park. How about you join us this year? And thanks for all the tips! Would love to if I'm back in shape! This is so relatable! Thanks for the one-word idea! You're very welcome! But thank Laura Lippman. Master (one-)wordsmith. Of course, she's a master of many words, too. But def. love her one word resolution idea. Committed. That's my word. I'm committed to getting my act together this year--on the writing front, on the losing weight front, on the spending quality time with the family front. And, I'm going to throw an ice cream party. In my cleanout efforts, I came upon a set of delightful "sherberts" that my grandmother had--you know, those sculpted glasses designed to serve sherbert or ice cream in. My daughter said they could probably go, along with the fourth set of china. I said I wanted to keep that fourth set for a dinner party. Her comeback--"Right, mom. Then you use it when you throw your ice cream party." I'm going to do it, just to show her. Ha! I have a bunch of china I got as wedding gifts. Picked out the (non) pattern (it's all white), but never use it, because china. I really need to start using it. Then just shove it in the dishwasher. Have at that sherbert party! I guess if I had to choose one word, it would be "focus." I'm writing more this year--2019, so far (I know, it's early yet) and want to keep up the momentum. I'm fairly organized and dedicated time each month to filing, etc. But this year, I'm trying something different to help my energy and focus--I'm learning something new unrelated to writing. I've been an equestrian for decades and that takes me out of my stories but today, I will take a knitting class. I think that might help increase focus and discipline. We'll see!